April 2006 – Ben Boyle lives here! Have you checked the list of UIQ 3 mobiles? I’ve been checking them out. When are they gonna come out!? How long can they be coming soon—how soon is soon? Things haven’t been the same since I switched to my “funky new phone” from my ol’ P800 PDA model. It was getting on a bit and it was time for a change but 1½yrs later and I gotta say predictive text is nothing compared to handwriting recognition! Plus I really miss the excellent calendar on the P800. And that you could get cool apps for it. Ah, I just miss having a smartphone. So the P990 looks set to be sweet but I cringe to think of the price. The M600 sounds interesting—no camera, but extra thin for carrying around. The W950 has 4GB of space, rivalling an iPod—doubtless incompatible with iTMS though—and a funky purple look. Hmmm, better save up. Hope you had a safe and fun holiday. 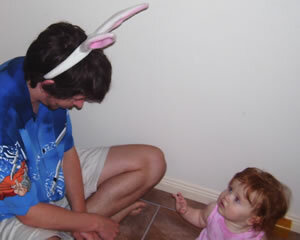 Here’s a snap of me explaining the Easter bunny to my daughter, with all the necessary props (pair of fake bunny ears). Google now offer to help you with romance. You know I met my wife on the Internet, but we had to trudge 15 miles through the snow carrying our camel just to IRC! Exaggerate? Me? Surely not. But the point is there wasn’t anything as sophistamicated as this back then. And as google themselves have noted, depending on your personality, you may or may not find this reassuring.